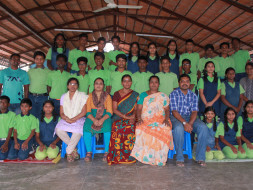 Parikrma runs 4 schools where thefutures of 1600 childrenare transformed. Children coming from severely disadvantaged homes where alcoholism, violence and poverty are the daily reality find a safe haven of learning and love and encouragement, in Parikrma. At Parikrma, education is everywhere. I have personally been working with them for 5 years and am constantly amazed by the students. Education is so important and Parikrma really does deliver on their promises. Financial support for the Pluto (grade X) class at Parikrma’s Jayanagarschool, covering their Education, Nutrition, Healthcare and Family care costsfor 1 year. Spending time with the children so that the children get greater exposure. Facilitate real change, ensuring that under-served children areprovided with everything they need to break the circle of deprivation andbecome contributing members of society. Akhila, well done!!! Sorry I just managed to get to it, after you finished the run! !